This story on No. 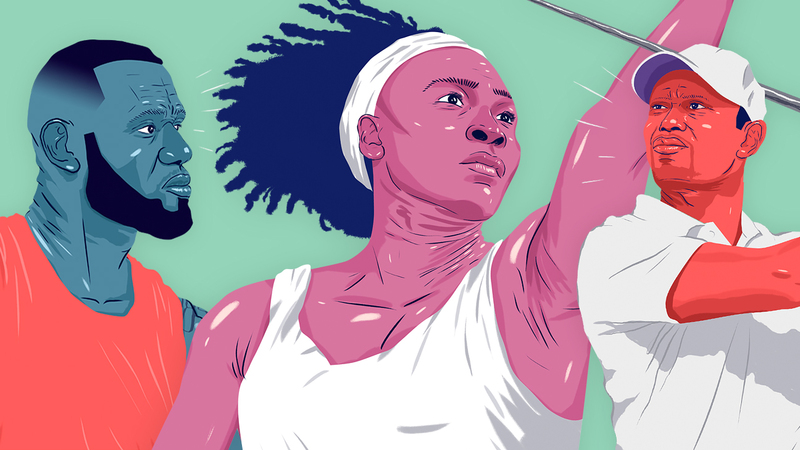 15 athlete Novak Djokovic appears in the 20th anniversary issue of ESPN The Magazine. Subscribe today! It's the semifinals of the U.S. Open, 2011, Novak Djokovic vs. Roger Federer, the winner to play Rafael Nadal in the final. It's late in the fifth set, Roger up 5-3 and serving for the match. The crowd is in hysterics. Novak has just flubbed two easy second-serve returns and is now facing match point. He walks to the deuce-side court to return serve. He looks at his player's box -- at his parents, coaches and trainers -- and he nods. He just calmly, coolly nods. Before this year, Novak might have had a very different kind of expression in this situation, a kind of fatalistic shrug he'd direct toward either his box or the sky, a pleading, nihilistic Why me? grimace that sometimes emerged when he was losing to a player he should have been beating. When his body was betraying him -- wheezing, sucking air -- he often wore this hopeless, pitiful smirk that implied something along the lines of: I am cursed. For several years straight, the ATP Tour was pretty much the Roger and Rafa show. Novak's role in this drama was to provide a little friction along the way, a capable "test" for the tournament's real protagonists. And for a while there, he did his job splendidly, losing to either Roger or Rafa 29 times between 2006 and 2010. But then 2011 happened. He showed up in January leaner, thinner, more fit, his body like a rope pulled fully taut. There was talk about a new diet, something about food allergies that had been, up until that point, undiagnosed. He suddenly won the Australian Open, dropping a single set and beating Roger in the semifinals. He beat Roger again in the final of Dubai, and again in the semis of Indian Wells, where he then beat Rafa in the final, a feat he repeated in Miami, and Madrid, and Rome, and Wimbledon. And now here he is trying to get to yet another grand slam final, this time in New York. All he has to do is break Roger Federer's serve at the tail end of a five-setter in Arthur Ashe Stadium, the largest tennis venue in the world, where the whole crowd is basically in ecstasy. Everyone else in the world wants to see the 20th meeting between Roger and Rafa in a tournament final. So each of Roger's winners -- and, natch, Novak's errors -- inspires the crowd into euphoric howls. It's gotta be a little annoying for Novak. It's as if the crowd has just forgotten that he's put on one of the most amazing sustained tennis performances of all time. He's lost a mere two matches all year. And yet, whenever he wins, he's somehow the bad guy, ruining everyone's fun. Novak is preparing to return serve. He has that broad stance where his feet are way wider than shoulder width apart -- a large base tapering to a skinny top that recalls, maybe, the shape of the Eiffel Tower. He's played most of the match wearing a hat, but he's just now tossed it aside, this white hat with the blocky capital T inscribed in a circle. Whereas Roger is wearing a Nike shorts/shirt combo that can be found in any suburban mall in America, here is Novak dressed in Sergio Tacchini, a brand that is less like an athletic apparel company and more like the rumor of one. Novak always seems to do things just a little different. The Tacchini, however, is a big step up from what Novak's father, Srdjan, wore to the previous year's U.S. Open, which was a black T-shirt with the hilariously enormous image of his own son on it, a full-color photo showing a fist-pumping Novak who, in the T-shirt, is himself also wearing a weird T-shirt imprinted with the hilariously enormous image of (for some reason) a blue bald eagle. This shirt was so campy and over the top that it looked like it was made after losing some really creative bet. But Novak didn't seem to mind, or even notice. He'd fist-pump at his dad, who would fist-pump back, momentarily obscuring the comically huge image, on his chest, of Novak fist-pumping. It was all very meta. Roger connects with a first serve, roughly 100 mph, a little sidespin on it so the action makes it slide away from the receiver. Novak lunges to his right, and he hits this crosscourt forehand. Or maybe "hit" is the wrong word for it -- too prosaic for this particular forehand, which is actually "battered" or "smashed" or "clobbered" or "punished" or something really savage like that. The ball goes tearing across the court. Roger doesn't even move. And the crowd, which initially roared at what it thought was a Novak error, now understands a shocking reality: The ball was in. How in the world was that ball in? Hitting a ball that fast, and that flat, and at that angle, without clipping the net or hitting long, is, for all intents and purposes, impossible. It's a shot with so little margin for error, a shot so hazardous and risky, that nobody in the stadium can quite believe it, least of all Roger Federer, who, in the news conference after the match, when asked whether this particular forehand was the product of skill, will rub his eyes in this weary, dejected way and say: "Are you kidding me? Please. Look, some players grow up and play like that. I remember losing junior matches where they're down 5-2 in the third and they start slapping shots, and it all goes in for some reason." Which, of course, is meant as an insult to Novak, but turn it around and think just a little bit about what that forehand did to the great Roger Federer: It made him feel, for a moment, like a child. This is Novak's whole approach: He wants to make you feel helpless. He wants to make you feel like there's nothing you can do, because he is fast and he is fit and he is unrelenting. He will get to everything, he will send everything back. He will smother you. There's a Rocky Balboa-type tenacity in Novak's game: He will take your best shots and turn them into his best shots. And he will do it all day. Roger will not recover from the shock. He will dump a few routine balls into the net, then double-fault on break point. He won't win another game. Novak will go on to the final, where he will defeat Rafa for his third grand slam of the year, improving his record to 64-2. But before all that happens, there's this moment right after Novak hits that forehand, as both players are going for their towels and the stadium is stunned and disquieted, when Novak raises his arms to those in the crowd, beseeching them -- and it isn't like the old Novak Why me? thing he did in years past. No, it's more like he's asking the crowd: What more do I have to do? And the crowd, finally recognizing that it's watching something truly great, gives him the long, loud ovation he so richly deserves. Nathan Hill's debut novel, "The Nix," was named one of the best books of the year by The New York Times and was translated into 30 languages.